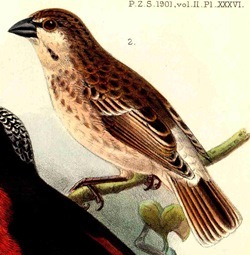 Donaldson-Smith's Sparrow-Weaver was formally described by Richard Bowdler Sharpe, an English zoologist. Donaldson-Smith's Sparrow-Weaver was collected by Arthur Donaldson Smith, an American doctor, amateur big-game hunter, and explorer of Africa. In in 1894-95 Donaldson Smith undertook an 18-month geological expedition in East Africa. The expedition started in Berbera, Somalia (then British Somaliland), passed through what was then Somaliland, southern Ethiopia and then to Lake Rudolph (now Lake Turkana) in Kenya. Donaldson Smith collected birds and many animals, particularly fish, spiders, scorpions, butterflies and beetles. 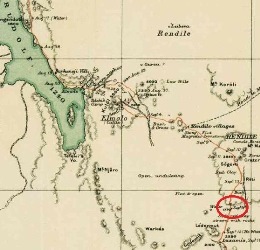 The expedition left Lake Rudolf on 24 August 1895, and went SW, and crossed Marsabit Mt. On 13 September Donaldson Smith had a close encounter with an elephant, and the next day he collected the weaver specimen. He reached Lasamis on 16 September. Donaldson Smith wrote a book about his travels, which can be downloaded here (295 Mb). The first illustration of the Donaldson-Smith's Sparrow-Weaver was of an adult, published by Sharpe (1901). The next illustration was a black and white photo of nests by Oberholser (1945). Plocepasser donaldsoni	Sharpe 1895a,	Bull. Br. Orn. 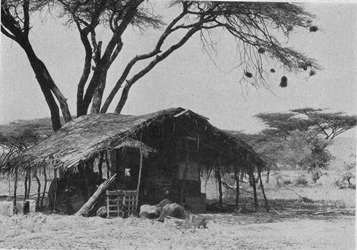 Club, 5, p.14	'Eastern Africa' = Lasamis, Kenya. donaldsoni, Named after A. Donaldson-Smith (1864-1939) US zoologist and collector in Somaliland, 1894-1895. 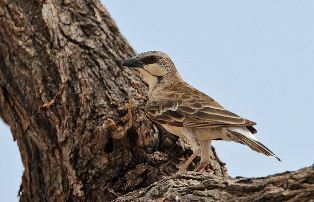 Donaldson's Sparrow-Weaver, Somali Grey Sparrow Weaver. The type is in the British Museum (BM 1895.7.7.23). Identification. Donaldson-Smith's Sparrow-Weaver is a localised species in East Africa. It overlaps in range with the more widespread White-browed Sparrow-weaver. Both species have a white rump, but the Donaldson-Smith's Sparrow-Weaver has no obvious white in the wing and has a very different head pattern (scaly crown, no white eyebrow, pale cheeks with black moustachial stripe). Distribution. Donaldson-Smith's Sparrow-Weaver is found in southern Ethiopia (eg. Mago National Park, but rare in Omo National Park) and in northern Kenya (particularly in the Isiolo district game reserves). 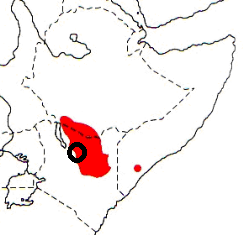 In Somalia, it has only been recorded at Afmadow (see map below, based on Birds of Africa). It is a common but very local bird. No subspecies of the Donaldson-Smith's Sparrow-Weaver have been proposed. Donaldson-Smith's Sparrow-Weaver is poorly-known. Its call has been recorded - see here. Habitat. Donaldson-Smith's Sparrow-Weaver inhabits dry bushland, open woodland, grassland and rocky areas; and even in barren lava country in north Kenya. Food. Donaldson-Smith's Sparrow-Weaver forages on the ground, feeding on grass seeds and insects. It occurs in small flocks, which may associate with the White-headed Buffalo-Weaver. Breeding. Donaldson-Smith's Sparrow-Weaver is colonial. Its mating system is unknown but it is probably a co-operative breeder, like other sparrow-weavers. The nest is a mass of grass with a short entrance tube, lined with feathers; it resembles the nests of other sparrow-weavers, but is larger than that of the White-browed Sparrow-Weaver. The nest is placed in low thorn trees 1.5-3m above the ground, or in stunted bushes. A colony of 20 nests in a single bush has been recorded. The eggs are pinkish or greyish, with fine speckles of mauve and reddish-brown, but clutch size has not been recorded.